I am seriously late this month. Considering that I finished the challenge about two weeks ago, the fact that my post is three days late is a bit disappointing. Time somehow manages to slip away from me and a 24 hour day is just not enough for all the things on my agenda. It's been like that for a couple of months now and it's a real pain in the neck, I tell you. This challenge was a bit different from the previous ones. 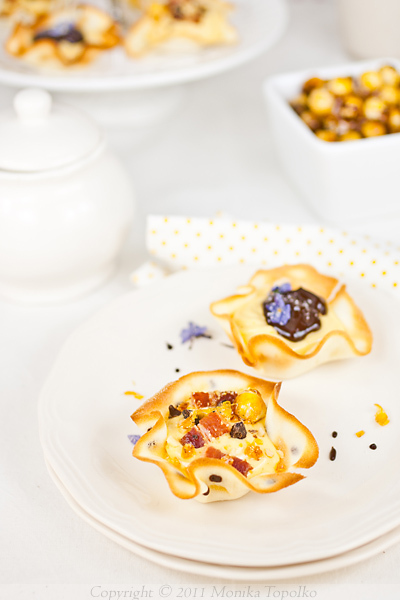 First of all, this month's challenge involves a prize for the most creative recipe and, as far as I can tell, it was a great motivation to really give it our best. 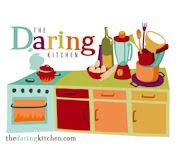 The creative juices were flowing all around and, once again, the Daring Bakers around the globe have outdone themselves in the creativity test. The only recipe we were obliged to make was the maple mousse. Everything else was left to our imagination. This was truly a challenge for me because I've never tried maple syrup before so I had no idea what flavors to pair it with. Having completely open hands on the choice of an edible container and maple mousse topping was another stumbling block. Having too many choices is never a good thing for me. I usualy have bunch of ideas and then can't decide on just one so I keep postponing the decision and end up making up more combination along the way. I did, however, manage to resist unncessary complications and I decided to make two simple versions of the dessert. 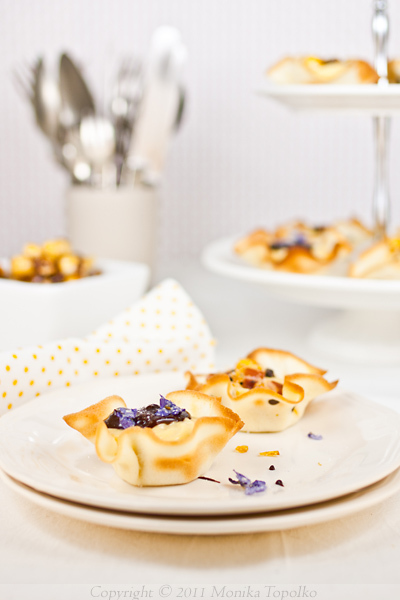 For the containers I chose simple tuile biscuits that I've shaped into little cups. Evelyn, our hostess, suggested making baked bacon cups for the mousse, persuading us that the combination of maple syrup and bacon is "flabbergastingly good". I knew immediately that I have to try some form of this flavor combination because I would have never thought of pairing the two in any given circumstance and there's nothing I enjoy more than trying out new and "exotic" flavors. 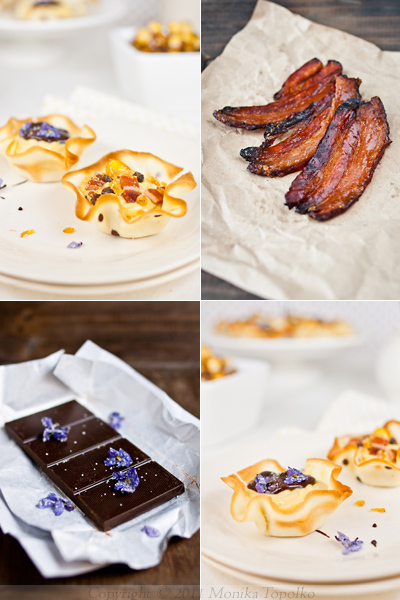 Instead of the bacon cups I made candied bacon, which was by itself sinfully good. It was tasty on top of maple mousse too, but a bit too rich for my taste. I topped those cups with some chopped dark chocolate to balance the sweetness of the mousse, and decorated it with some hazelnut praline that I had lying around. I then decided to make another version of the cups. Having realized that the mousse is quite sweet, I decided to balance it with a really nice and silky dark chocolate ganache. I remembered I had some more candied violets and thought they would fit nicely into this combination. This one was a winner. I normally don't like very sweet desserts, but this one was sooo good. Although D. was looking forward to the maple-bacon combination from the start, he too admitted that the chocolate version was a lot tastier. Bring maple syrup to a boil then remove from heat.In a large bowl, whisk egg yolks and pour a little bit of the maple syrup in while whisking (this is to temper your egg yolks so they don’t curdle). Add warmed egg yolks to hot maple syrup until well mixed. Measure 60ml of whipping cream in a bowl and sprinkle it with the gelatine. Let it rest for 5 minutes. Place the bowl in a microwave for 45 seconds (microwave for 10 seconds at a time and check it in between) or place the bowl in a pan of barely simmering water, stir to ensure the gelatine has completely dissolved. Whisk the gelatine/whipping cream mixture into the maple syrup mixture and set aside. Whisk occasionally for approximately an hour or until the mixture has the consistency of an unbeaten raw egg white. Whip the remaining cream. Stir 1/4 of the whipped cream into the maple syrup mixture. Fold in the remaining cream and refrigerate for at least an hour. Remove from the fridge and divide equally among your edible containers. Makes about 20 cups, depending on their size. Mix together powdered sugar and flour. Beat the egg whites until soft peaks form. Gradually add the sugar mixture, mixiing until well incorporated. In the end, add the butter and stir to combine. Allow the mixture to come to room temperature before baking. Take one tablespoon of the batter and transfer it to a small bowl. Add the cocoa powder and mix until incorporated. Transfer the cocoa batter to a ziplock bag and cut a tiny hole from the corner. Preheat the oven to 180°C. Line a large baking sheet with parchment paper or silicone mat. Spread a teaspoon of the batter onto the parchement paper in the shape of a circle. Make sure it's thin and even on all sides. Take the cocoa batter and draw decorations on the circle. You can make dots, stripes, swirls or whatever you like. Bake for 5-6 minutes or until golden on the edges, then remove from oven and immediately place over a glass or a cup, shaping the biscuit into a small cup with the help of your hands. When it cools, remove it from the glass and transfer to a plate. Repeat with the rest of the batter. Heat the oven to 200°C and line a baking sheet with aluminum foil. Lay the strips of bacon on the baking sheet with about 1 cm of space between them. In a small bowl combine the brown sugar, cinnamon, paprika and maple syrup until well combined. Sprinkle the mixture evenly over the bacon. Bake for 15 to 20 minutes, or until the bacon is crisp and the topping is bubbling. Cool completely. Once cool roughly chop the bacon. 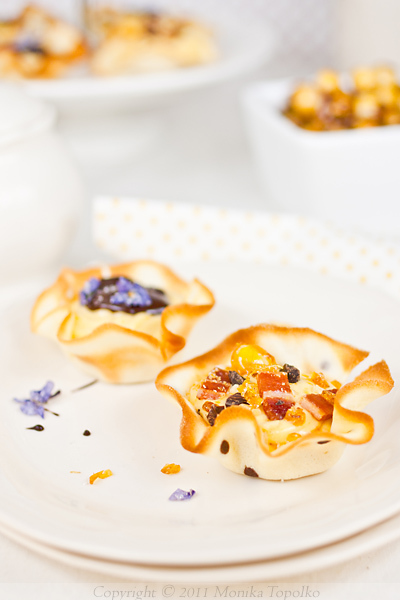 Fill half of the tuile cups with maple mousse, top with candied bacon, hazelnut praline and some chopped chocolate (or chocolate chips). Put the cream and violets into a saucepan and heat until bubbles start to form. Cover and let it seep for 15 minutes. Heat again, remove violets and pour over chopped chocolate. Let it stand for about a minute and then stir until chocolate is melted. 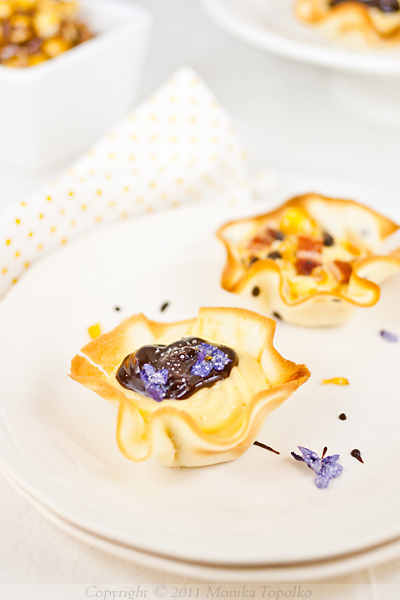 Fill the remaining cups with maple mousse, top with chocolate ganache and decorate with candied violets. Very pretty! They look like little flowers. Great job. Jako lepo izgleda mada sam skeptična po pitanju slanine u celoj toj priči. Kandirane ljubičice su....uf, ne mogu da nađem pravu reč da se izrazim....ma fenomenalne! 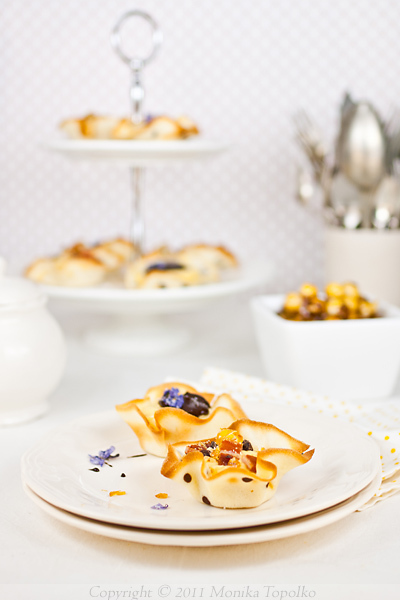 Your tuiles are shaped perfectly and your mousse looks delightful, especially garnished with candied violets. Bas mi se dopada, sjajne fotografije i prezentacija! Jako mi se sviđa sve što si napravila, stvarno sam oduševljena i fotkam i prezentacijom, a ušećerene ljubičice su savršeni touch. Monika, prekrasno je! Ne moram ti ni govoriti kako su ti fotke divne (i da me uvijek iznova očaraš), a vidim da ti ni slanina u desertima nije strana :) Sve pohvale! Fery beautiful! 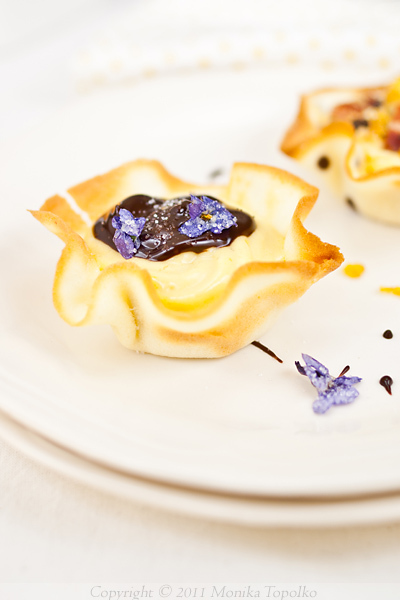 I love your tuile cups. mmmmmmm javorov sirup.dakle ovakvog deserta ne bi se ni neki restoran sa cuvenom zvezdicom postideo,Ja obozavam javorov sirup..i lako ga je ovde nabaviti.Vec sam miris..odlicno si ovo iskombinovala. Monika ovo je prekrasno ! Jako mi se sviđa tvoja izvedba ovog zanimljivog recepta. Doslovno, čitam gledam i uživam. Super ! !